Mt. Everest: highest mountain on earth with a height of 8.848m, incalculably and incredible fascinating at the same time, first ascent in 1953 by Tenzing Norgay and Edmund Hillary. All these thoughts come automatically in our minds when we hear this name. And it inspires many of us to experience this mountain in reality, to explore the area, where the big expeditions on the peak start and to feel the atmosphere between these huge mountains and large glaciers, which let us feel so small compared to this incredible landscape. 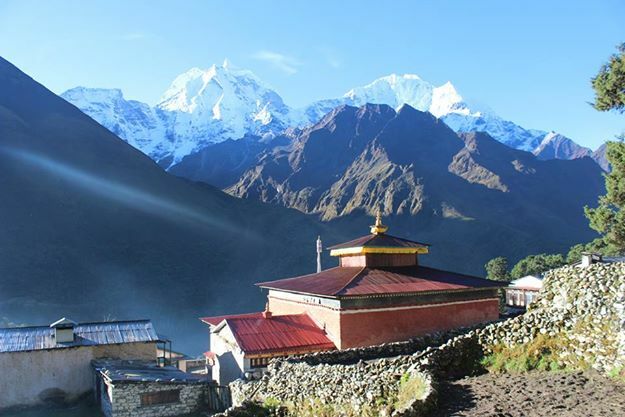 You can hardly find a region which is more spectacular than Everest region. It is where four of the world's six tallest peaks Mt. Everest, Mt. Lhotse, Mt. Makalu, and Cho Oyu rise above everything else, crowning the towering ridges that straddle the forbidding Himalayans. 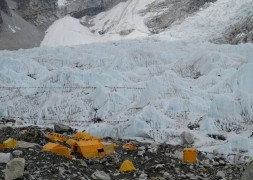 The Everest Base Camp trek is the grandest walk in the land of the Himalayas. 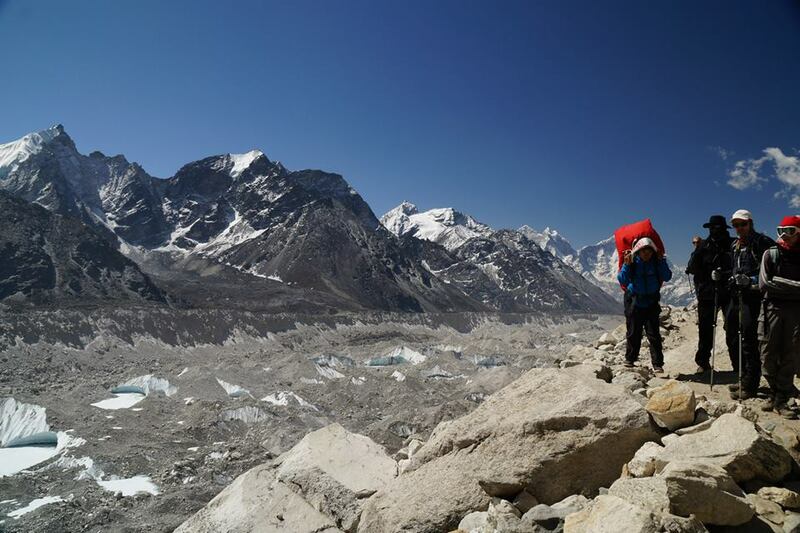 Trekking through the Everest region offers stunning mountain views, and opportunities to get a glimpse into the life of world famous climbers (the Sherpas). The trek further offers the opportunitiy to walk through Sagarmatha National Park, a world heritage site that is home to a variety of Himalayan floras and faunas, to get a closer look at the highest Buddhist monasteries in the world, and, of course, the most gratifying of them all, the trip to Everest Base Camp itself. It is an opportunity to embark on an epic journey that Sir Edmund Hillary and Tenzing Norgay set off on in 1953. ​But nothing beats the thrill and sense of accomplishment that grips travelers on seeing the power and grace of the mighty Everest up close. Day 01: Arrival in Kathmandu. Transfer to Hotel. Welcome Dinner. Day 03. 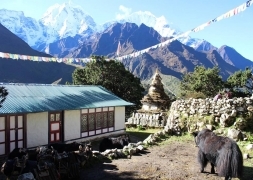 Fly from Kathmandu to Lukla (2.860m) and Trek to Phakding (2.610m) 4Hrs. Day 04: Trek to Namche Bazar (3450m) 6Hrs. Day 06: Trek to Tengboche (3860m). 5/6Hrs. Day 07: Trek to Dingboche (4350m). 6 Hrs. 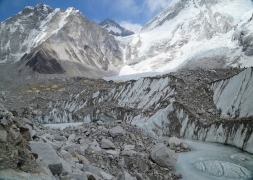 Day 09: Trek to Lobuche (4930m). 6 Hrs. Day 11: Climb Kalapatthar (5550m). Trek back to Pheriche (4.250m). 7Hrs. Day 13: Trek via Namche Bazar to Jorsalle (2860m). 7Hrs. Day 14: Trek to Lukla (2840m). 5 Hrs. Day 15: Fly to Kathmandu. Transfer to Hotel in Bhaktapur. Day 16: Sightseeing in Bhaktapur; Farewell dinner. Day 17: Free day. Transfer to Airport. Upon your arrival at Tribhuvan International Airport (TIA) in Kathmandu, a representative from our organisation picks you up and transfers you to the hotel. Today you have a welcome dinner and can try authentic Nepali food like Dal Bhaat, what Nepali people eat 2 times a day. You also get to know your guides who provide you a detailed briefing on your upcoming trek so that you are well prepared for the trip and any last-minute question will be answered. Today you visit the most important sightseeing locations of Kathmandu. After breakfeast you drive to Swayambunath, the "Monkey Temple" of Kathmandu, a buddhist pilgrimage place with a small stupa. After that you visit the Kathmandu Durbar Square with its pagodes, the home of the living goddess Kumari. Then you drive further to Pashupatinath. It is an important pilgrimage place for Hindus and a lot believers from India come there every week. There are lots of temples and at the shore of the holy Bagmati River, the believers burn there dead relatives. Then you go back to the big stupa of Boudhnath, which is also known as little Tibet and enjoy your dinner at the rooftop of the hotel with view of the stupa. After breakfast, we will be escorted to Kathmandu domestic airport for an early morning flight to Lukla (2,800m), which is itself a great adventure and takes about 40 minutes. This is one of the most beautiful air routes in the world culminating in a dramatic landing on a hillside surrounded by high mountains peaks. In Lukla we will meet our other crew members and after some packing and arrangements, we start our trek through the prosperous village of Lukla until we reach Phakding. Our walking distance is not far today, so if you are interested, you can visit a small monastery near Phakding. Today you will follow the Dudh Koshi River and cross several rope bridges, one of them the famous Hillary Suspension Bridge. The first few hours the way is not very steep and you can get the first great views of Mt. Thamserku (6618m) and enter Sagarmatha National Park. After crossing Hillary Bridge, the trail starts getting very steep and you have to climb about 1 1/2 hours until you reach Namche Bazar, which is the main trading centre of this region. If you forgot anything you need for the trekking you can be sure that you can buy it here. 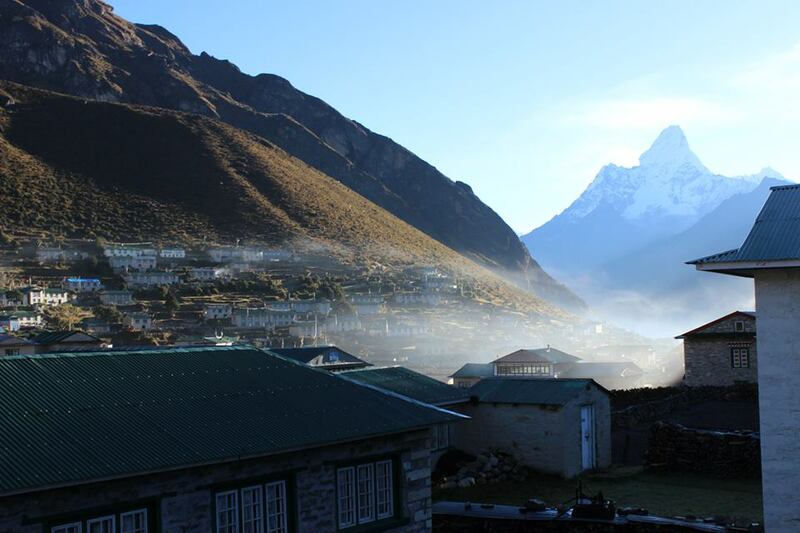 In the morning we will continue our way to Dingboche. 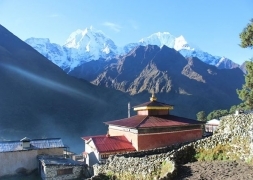 Our journey starts with a spectacular view of Tenboche monastery in front and the high mountains in the back ground. On arrival at Dingboche, we will see beautiful arrays of fields enclosed by stone walls to protect barley, buckwheat and potatoes from the cold winds and grazing animals. We spend our second day of acclimatization in Dingboche. A refreshing breakfast while admiring a looming Ama Dablam (6856m/ 22493 ft) to the south is really fantastic. 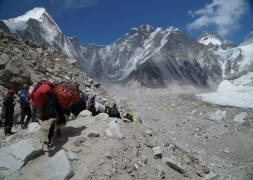 To better appreciate Mt Ama Dablam, Mt Lhotse and numerous other peaks visible from Dingboche, we climb the hill on the north behind the village. This will be an ideal acclimatizing excursion. From there we can see three of the world's six highest peaks, Mt Lhotse, Mt Makalu and Mt Cho Yu. To the west, loom the towering peaks of Cholatse (6440m) and Taboche (6542m). 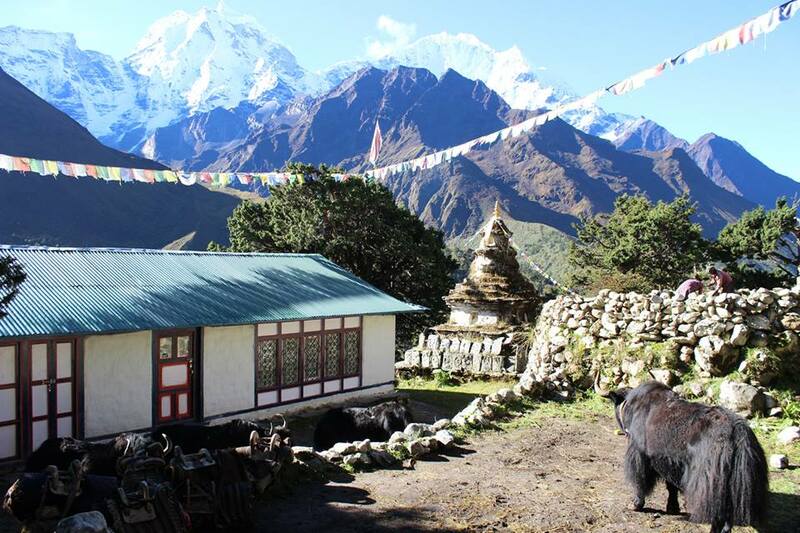 As we look northwest, we see an array of peaks rising at the head of the Khumbu Khola valley. 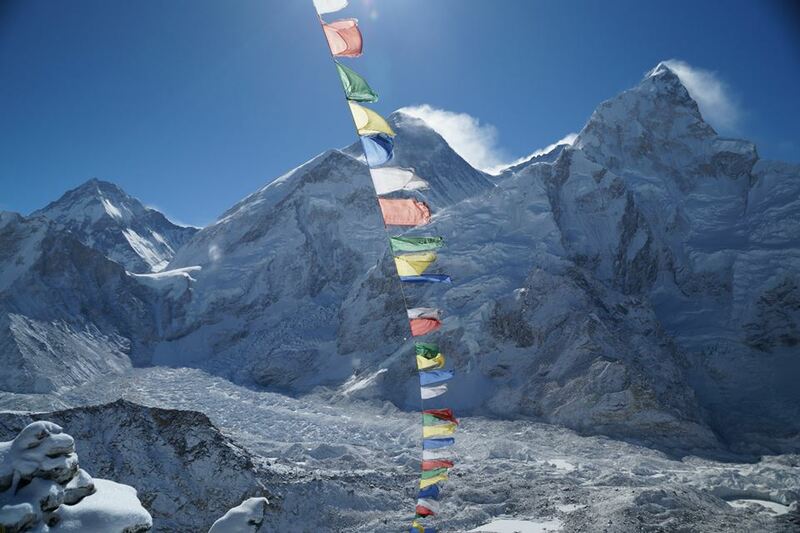 The Lobuche West and Lobuche East peaks are most dominant along with Lhotse which stands over 8500 meters (8501m). From a vantage point high on the ridge, we can scan the sweeping Imja Khola valley as well as the picturesque fields and pastures of Dingboche. After a brief lunch and rest, we continue our way to Everest Base Camp. From the Base Camp we are not able to see Everest but instead we have good views of Nuptse, Khumbutse and Pumori. After breakfast in Gorakshep you will trek down to Pheriche. Just after the start of our trek, we cross Khumbu Khola (stream). Today you will feel much easier by walking downhill to a lower elevation. After breakfast the trail goes down through forest with pine, Jupiter, rhododendron and some few magnolia and birch trees. With the great memories of the spectacular views of the last days it is easy to walk. Short time before we reach Namche we have to say good bye to Ama Dablam, which was a long time present during our trek. Here we will see the high mountains the last time. Only Mt. Thamserku will be visible further down also. Because we are acclimatised now It is easy for us to walk in lower elevations. Experience the atmosphere of Everest Base Camp, next to the biggest mountain on earth and watch the rising sun behind Everest peak from Kala Pathar early in the morning.